The exterior is very similar to the Satellit 2000. 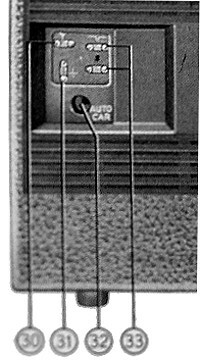 After having used slide-controls for Volume/ Bass/ Treble on the prior two models (Satellit 1000/2000) Grundig luckily reverted to the familiar round controls. Dirty and/or worn lamels for the slide-controls made for crackles when operating. 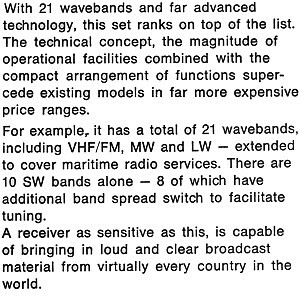 The radio now produced less noise when operating at low volume-levels and when using earphones. The battery-compartment lid now needed 7 (!) screws to open and close , maybe former models had to "loose" a design. 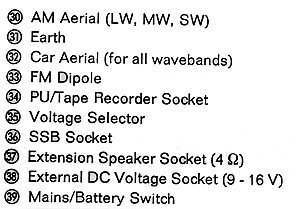 In addition to adding an SSB unit (and the familiar outdoor antennas) now also the option to add a LW direction aerial (DF Aerial RS2T / from company RAMERT). The following interesting information/project was received from Luca Stramare of Italy, October 2000. I recently got a Satellit 2100 from a friend. The radio was in very ugly conditions, but, since this radio was my dream when I was a young boy, I decided to attempt a restoration project. 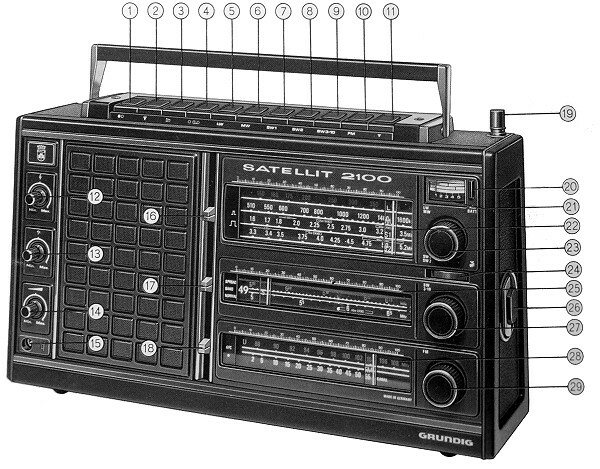 I must also admit that your fantastic pages on the Satellit radios played a significant role in my decision to restore the 2100. The chassis had several scratches and it's slightly different from the one in your pictures. The holes in the speaker grill are smaller. I disassembled the radio and consumed two cans of compressed air and some contact cleaner. Some wires had to be replaced or re-soldered, but I could manage to handle the job. With horror, I discovered that the speaker was completely destroyed. The good news is that you can fit a nice 13 cm (2 -ways) speaker, the one used in cars. The holes in the case perfectly match and there's plenty of room for the magnet. For about 50 DM I got a couple of nice 13-cm coaxial 2-way titanium-cone speakers and fitted one of them in the radio. With some patience I connected the tweeter and the woofer separately, as in the original. Now the sound is impressive. I never heard a portable radio sounding so good. I hope this can help other people facing with the same problem. yesterday I fitted the dial plate. Looks like new, now. Made the labels with a Dymo labelmaker. Tomorrow I plan to repack everything. I will take some pictures for your page. If everything goes the way it should go, the 2100 will play the afternoon news for me. Please find the project presented in more detail in "Div.Info" menu / Left frame ,opening page.